This characterful yarn is dyed with onion skins using a completely natural, traditional process. 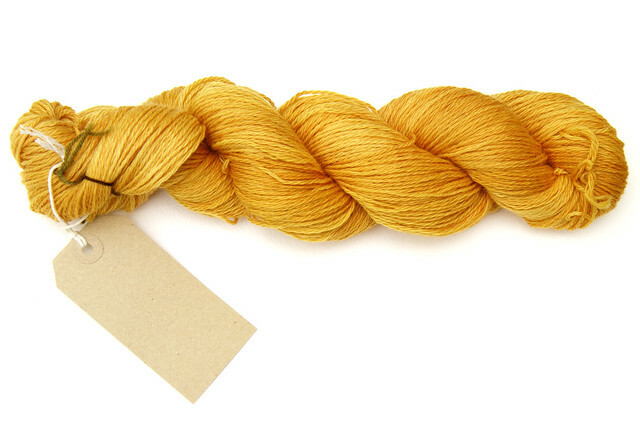 This skein is a semi-solid, bright golden yellow colour. The base yarn is a super-soft merino blend with nylon for extra wear. It is perfect for lace shawls, socks and other accessories. Onion skins are one of the most readily available and reliable natural dyes, producing a range of shades from bright yellow to tan. Onion skin dye is fully colour-fast, though as with all natural dyes, the shade may fade slowly over time with exposure to sunlight. This shade is a non-repeatable – only one skein available.